NSK announces the market’s first LED electric micromotor. A New Generation of Micromotor as well balanced as an air turbine. The NLX Nano system combines user-friendly ergonomic design with lightweight titanium. The NLX Nano micromotor weighs a mere 61 grams – up to 40% less than competitive units – making it the lightest motor in its class. Smooth, quiet, powerful, and versatile, the NLX Nano feature the market's first LED fiber optic micromotor. The NLX Nano has attachments available for all specialty areas and the system can be easily integrated into virtually any dental delivery system. The balance of the electric micromotor with attachment has been dramatically improved with the introduction of the NLX Nano. The overall length of the NLX Nano combined with the speed increasing attachment is identical in overall length to a highspeed air handpiece with coupler. The reduction in weight and length of the NLX Nano micromotor lessens hand fatigue and allows for a greater degree of control. The NLX Nano has been reduced in weight by 20% and size by 25% compared to the current Brasseler USA/NSK micromotor. 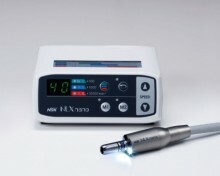 Despite its smaller size and lighter weight, NLX Nano is more powerful and offers the same speed range as the current brushless Brasseler USA/NSK clinical micromotor. 32,000* LUX of LED generates natural daylight-quality light, which assures clearer vision when compared to halogen light. No other electric motor on the market offers the LED feature. LED light sources are longer-lasting and more durable than halogen bulbs, saving you money. Pictured below. which plugs directly into any 4-hole tubing, allowing the use of your existing foot control. Click the button below to add the NSK NLX Nano Dental Micromotor Control Unit to your wish list.